The Royal PUB blends decor inspired by St. George’s chapel, the traditional location of all British royal ceremonies, with a typical British pub. As wedding bells are about to ring across the pond for royal couple Prince Harry and Meghan Markle, a new pop-up bar opened to honor the May 19 ceremony. The Royal PUB, located at 1843 7th St. NW, is a haven for all District anglophiles, with decorations and drinks inspired by the Windsor family. The wedding-themed bar opened Friday and is hosted by Drink Company, which has opened limited-time bar openings in the space for the past two years. Adriana Salame-Aspiazu, the special projects manager for Drink Company, said she decided on a wedding-themed pub because of her family’s lifelong love affair with the royal family. The front window of the establishment is embellished with a copy of the wedding invitation drawn in oversized cursive script. At the front of the bar, faux white flowers cover a wall and light tulle drapes from the ceiling. The rest of the room blends decor inspired by St. George’s Chapel, the traditional location of all British royal ceremonies, with a typical British pub. Along the walls, heraldic flags from British history are displayed like in the chapel. The details continue with fake stained-glass windows across from the bar and a decorative ceiling that mirrors the church’s vaulted canopy. Opposite the lavish stained glass, dark wood-paneled shelves house British-made knickknacks. 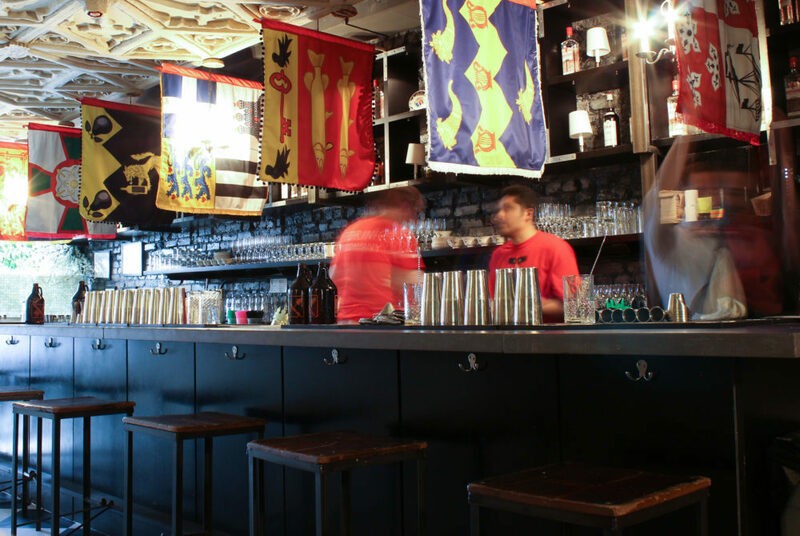 Dozens of Union flags hang by the bathrooms and a red phone booth stands at the end of the bar counter. Though the decorations are distinctly British, homages to the royal couple’s engagement are the central focus. Porcelain cups plastered with the couple’s faces sit behind the bar, though most drinks are served in champagne flutes. In the back throne room, customers can take pictures on a velvet throne next to cutouts of Prince Harry and Markle. The menu hosts creative cocktails to honor the family, ranging from $13 to $14. Try the “Markle Sparkle,” which contains aperol, rosé cider, sparkling water and edible glitter, or the “Put a Ring on It,” a combination of Hendrick’s gin, lemon and champagne – with a cucumber and fake engagement ring on top of the glass. Royal wedding cake-flavored shots mixed with elderberry and tea are available for $5 each, along with an assortment of ciders, beers, wines and scotches to sample, with prices ranging from $6 to $15. Visitors can drop by the bar any time until May 20 without a reservation. For the more devoted royal fans, the bar will host an early morning wedding viewing party on May 19. Tickets will be available online and all proceeds from the sales will go to the Invictus Games, a charity created by Prince Harry to help wounded soldiers from across the world.